Home » Cloud Server Security Tips & Tricks » What needs to be backup and to where? Disaster Recovery is about restoring your daily business routine back to order. There is no good Disaster Recovery plan without sufficient backup. The key question is WHAT needs to be backup and to WHERE? This post elucidates these concerns in great depth to help you with the answers! What needs to be backup? If this question comes to your mind, it probably means you simply do not want the risk of losing any data when you need them. Your best bet? Full snapshot backup. Using free software like Veeam Backup Agent, this can be done easily with a few clicks. What happens is that with full snapshot backup, the backup software saves the current state of your computer into backup. It includes everything including your operating system and applications installed. When it comes to recovery, usually by using the software’s boot disk (Veeam Recovery Media for the case of Veeam), you are able to easily restore all your programs and files from the backup media. This gives you total protection at the expense of larger initial backup (subsequent backups captures only the data changes known as the delta/differentials). File-based backup in contrary as the name suggests, only the files are backup. Operating system and programs are excluded. Most of you should be unknowingly doing this method of backup, ie copying important files into your USB drive/Dropbox/Google Drive. A more organised way of doing this backup is to use backup software, again free ones like Veeam Backup Agent can do it well, including the ability to perform the backup at fixed schedules. File-based backup do not require large storage space to keep the backup but you must be really careful to include all files and folders that you know are important. 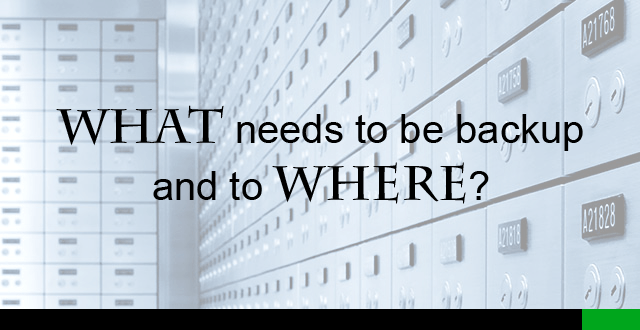 Where should the backup be stored? You should always store at least a local copy :- USB drive, portable hard disks, network attached storage (NAS) are ideal choices. Storing a local copy ensures that when you need the restoration to be done, it can be done quickly. Next of course, storage on the cloud is required :- Dropbox, Google Drive, or any cloud backup service you prefer are good places to start. Storing a cloud copy ensures that the file is always there in the unlikely event that your local copy is corrupted (failed hardware, lost hardware, you-name-it-you-have-it). Contact us if you wish to discuss anything about your company’s Disaster Recovery or Cloud Backup requirements with us!